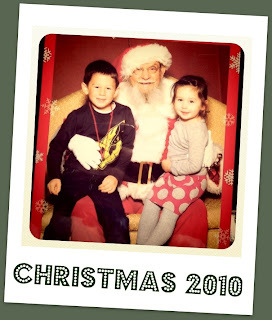 We saw Santa yesterday. To date, it was our easiest encounter with The Big Guy. We parked not knowing where Santa would be set up. We walked in the doors and he was right there. There was no line. Santa asked for high fives, the kids obliged. Vaughn hopped up and said she wanted a Cinderella dress. Vance followed and said he wanted a Nintendo DS...and a guitar. Kids smiled, picture was snapped, candy canes were doled out. It all took less than 5 minutes. That's my kind of Santa. Honestly, seeing Santa always seems like a chore. I'm always glad to have it checked off our to-do list. I keep all the Santa pictures from previous years in the same frame and just add the newest one on top. It's fun to unpack it from the decorations and look at the old ones. Have you seen Santa? How'd it go? While celebrating my son's homecoming from Afghanistan, my husband and I had the happy opportunity to "babysit" our little granddaughter. My son and his fiance had some talking to do and so we grabbed the opportunity. Peyton was napping pretty much the whole time as we strolled the mall. Then I saw him; Santa. I sort of flippantly said to my husband, we should get a picture with Peyton and Santa. But I didn't want to wake her. We walked more and by the time she woke up, we were right by Santa again. There was pretty much no line. We got her out of her stroller and she was pretty surprised at where she was; very noisy and bright...and started crying. I asked my husband if he had paid for it yet and he said no. I told him it's really not the optimum time and we packed her up and went back to the hotel. In telling this story to my son and his fiance...I think I stepped on some toes. I told her I assumed she had already taken her to see Santa, but she said she was waiting for my son to come home. And she cooed at Peyton that she was a good girl to cry and ruin the moment. Oops! bad grandma.